A story about love, loss and a car, is based on a heartbreaking true story from the American Midwest. 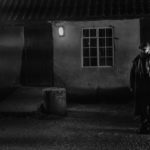 Richard Prendergast based his film in the flat and barren landscape of east Norfolk, which brings its own lonely character to the narrative. Follow Annette as she returns from London to her semi-rural home, to help her sisters pack up their father’s house after his death. But the siblings in this ten minute comedy can’t agree on the fate of one family heirloom – a mysterious bronze tiger. C Shells documents a lifelong friendship re-found through recovery. Two inspiring women, friends since childhood, reflect on illness and the strength derived from a simple ongoing creative process, when their shell line became part of their recovery. A contemporary Western set in the heart of rural East Anglia that tells the story of Ron – an aging Knacker who is responsible the disposal of ill horses and livestock. When his own horse falls ill, Ron must decide it’s fate and in doing so, face his own mortality. The Suffolk Short Film Festival is a new festival launching in Ipswich in 2020. In 2019 the Suffolk Shorts team is curating three specially chosen short film programmes for First Light Festival; Tides and Times, East Anglian Stories and a collection of Family Festival Films.